Brashares, Ann. 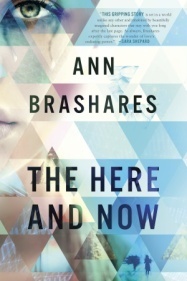 The Here and Now, Random House Delacorte Press, 2014. No longer the huge fan of science fiction I once was – at least in its traditional forms – and completely uneducated about the “YA” genre, I worried about giving this book a fair treatment. Add to that, the Random House web site classifies this book as “Juvenile Fiction – Girls & Women.” Luckily, chick flicks generally appeal to me (e.g., “Paradise” or “Le Grand Chemin”), so I braved the waters. Easing this plunge was its setting in the NYC greater metro area, including scenes set at nearby Jones Beach and the Meadowbrook Parkway. The clever title embraces a common poetic trope (living in the moment, for you neophyte Buddhists), and happily, the plot of The Here and Now had enough momentum and who’s who mystery to keep my attention through the pothole-filled roadbed of teen dialog. “I am amazed by the lushness, the generosity of it, all the things you can eat and plant and pick, the places you can swim. People here act like the great things have already been lost, but they are wrong. They have so much still to lose” (Ch. 3). “So many mornings I’ve woken with the burden of reassimilating sadness and loss” (Ch 16). “Lying here like this, I can imagine happiness. Not a kicky, bright kind, but a full almost aching kind, both dark and light. I can see the whole world in this way. I can imagine extending the feeling to other places and parts of the day. I can imagine holding it in my pocket like a liens, and bringing it out so that I can look through it and remember again and again the world that has this feeling in it” (Ch 14). Prenna and Ethan, the two lead characters, straightforwardly appeal to readers’ weakness for the underdog and the outsider. Both characters are strange, slightly antisocial, but not so strange as to stray far from the small universe of high school; we are not spared decisions about makeup, and the appeal of Tic Tacs and bacon cheeseburgers. The novel’s pleasures come as the time-twisted plot line is unwound, but also as Preena’s narrator-voice rises above the ordinary. “No matter how our hearts break, we bend toward life, don’t we? We bend toward hope” (Ch 26). “But the thing is, no one really believes in the future. Do they? It’s like believing in your own death. You can’t do it. Nobody can. Not even us, who have seen it all with our eyes” (Ch. 17). As Preena notes, even a broken clock is right twice a day. So it is with The Here and Now. The discordant language and predictable scenes are present, but the novelist finds a way – here and now – to get it right. What’s right is not where the characters have traveled. It’s what they can see. Advance complimentary copy provided by the publisher via NetGalley. “Teenage gunmen may once have seemed a chilling aberration, but have become, hauntingly, as much a part of the American risk landscape as joy riding and misadventure at prom. Books like Quick’s are necessary, if only because novels, at their best, do what horrific headlines cannot: they reintroduce human subjectivity into large-scale national disaster. It’s one thing, after all, to write a novel from the point of view of a shooting victim, but something else to trace the mind-set of the perpetrator. When the book is intended for teenagers, the moral responsibilities of the project become steeper still. “It is not always entirely clear that Forgive Me, Leonard Peacock has the stylistic brawn to bear its heavy load. For one thing, Quick’s narrator seems awfully jocose for a guy who’s homicidally depressed. We recognize some element of disconnected humor in the chilling work of the Columbine shooters. But would someone with a gun and a blind eye to human beauty and invention really quote admiringly from “=’Hamlet’ — he identifies with the protagonist — and offer prattling commentary on his own text in a lot of running footnotes? Would he crack jokes and make puns? 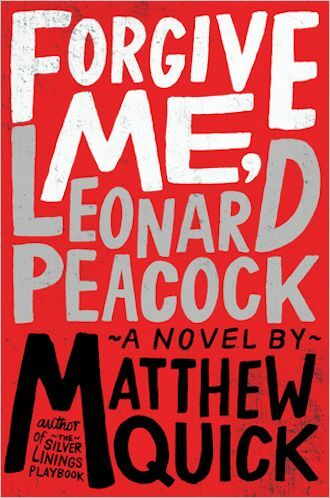 Forgive Me, Leonard Peacock is supposed to have profoundly real stakes, but its creative style is fast and loose and whimsical — so far from naturalism that it feels, at times, like a particularly wanton dream. Read the full @nathanheller review . . .